A political era ended in South Dakota with the defeat of U.S. Senate Democratic Leader Tom Daschle. Daschle became the first party leader in more than 50 years to be voted out of office. 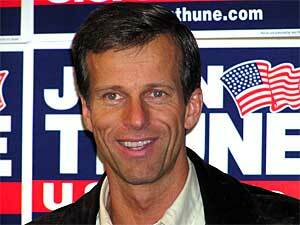 Republican John Thune beat him by a 51-49 percent margin. Sioux Falls, S.D. — Tom Daschle waited until midmorning on Wednesday, the day after the election, to concede. Daschle thanked a small group of supporters and staff, saying his Senate staff touched many people in South Dakota by helping them with problems. Daschle called those workers his heroes. The Senate minority leader spent most of his 15-minute speech talking about the issues and problems that still need attention. He said he's not done working for the people of South Dakota. He ended his speech on a note of optimism, describing the view from his Senate office of a sunset behind the Washington monument. "It's breathtaking. But there's something even more beautiful than that. My family and I have been at the base of Mt. Rushmore as the sun rises. Those colors are warm and sweet and optimistic. Having seen sunsets and sunrises, I like sunrises better," he said. Daschle's optimism contrasted with the mood of his audience. When he finished speaking the crowd applauded, but then quickly fell silent. The silence symbolized the sorrow people felt for a man they saw as both a friend and a political champion. Many cried. They were mourning the end of a 26-year political career which began when Tom Daschle was elected to the U.S. House of Representatives. In 1986, he won the first of three terms to the U.S. Senate. Last year, Daschel contemplated a run for the White House. Instead, he chose to remain the Democratic leader in the Senate and represent the people of his home state. This year's South Dakota Senate race was long and nasty and expensive. The campaign cost nearly $30 million. A large part of it went for television and newspaper ads. The new Sen.-elect John Thune argued throughout the campaign that Daschle had lost touch with most South Dakotans. Thune said Daschle didn't represent the state's views on social issues such as abortion and gay marriage. Thune also criticized Daschle for blocking President Bush's judicial nominees, tax cuts and other initiatives in Congress. Thune says he'll be a different kind of senator for South Dakota. "I will put South Dakota first, every single day, every single vote," Thune said. "Now the real work begins, because we have big challenges ahead of us. We need to end the gridlock, the partisanship, the political gains of Washington." Thune claimed victory in the early morning hours. He said it was clear Daschle could not catch his lead with the votes that were still outstanding. Two years ago, John Thune lost a bid for the U.S. Senate by 524 votes. This time he beat Tom Daschle by 4,500. I will put South Dakota first every single day, every single vote -- and now the really hard work begins. One of South Dakota's most familiar politicians supported Daschle's campaign. Former South Dakota Sen. George McGovern was the Demoratic presidential candidate in 1972. That year, McGovern lost his own heart-breaking campaign, losing in a landslide to Richard Nixon. In 1980, McGovern also lost in his bid for a fourth term in the Senate. He recalled that defeat, saying South Dakotans voted out the most influential senator they ever had. "In 1980, I was at the stage where I was about to have my choice of being chairman of the Ag committee or Senate Foreign Relations Committee. I was right up at the top of both. It never occurred to me when that campaign began that it would even be close," McGovern said. "I guess I can't expect everything to turn out the way I want it -- if it's 1980 or 2004." McGovern didn't like the tone of this year's South Dakota Senate race. He said Thune's claim that Daschle lost touch with the state and the voters was "horse manure." Political scientist Bill Richardson at the University of South Dakota says Thune won the support of Christian voters, and women concerned with social issues like abortion. Richardson says while many people tired of negative campaigns, in this case it worked. He says people listened and remembered. "You separate yourself from your opponent by trying to distinguish the ways in which you are different -- particularly when you are trying to characterize yourself as the person who best represents the values of your state. The negative ads did that -- the negative ads worked, and they also boosted turnout," said Richardson. Richardson says motivated John Thune supporters went to the polls in large numbers, part of a massive South Dakota turnout. Unofficial results show nearly 80 percent of registered voters cast ballots.